I encourage students to practice with the music they love while introducing new styles. Develop your inner clock and discover how to sit on-top, behind or in-front of the beat. Basic to advanced level stick control combining finger & Moeller techniques. Using the foot leg technique you can achieve efficiency, speed, dynamic range & accuracy. I teach private drum lessons from my drum studio in South Godstone which is on the Surrey / Kent borders and close to Junction 6 on the M25. Drum lessons are available to all ages and abilities, focusing on a natural and fluid approach to help you to play comfortably and confidently. Whether your just starting out or a more experienced player, it doesn’t matter what age you are.. learning to play the drums is fun, rewarding and inspiring. Feel free to get in touch and have a chat about your drumming, where your at with your playing and where you would like to get to. It’s important for me to understand what you would like to get from lessons, so I can plan your short term and long term goals. I will help you discover the best way to take on board new techniques and a mind set to practising and playing, taking you further a lot quicker than teaching yourself. 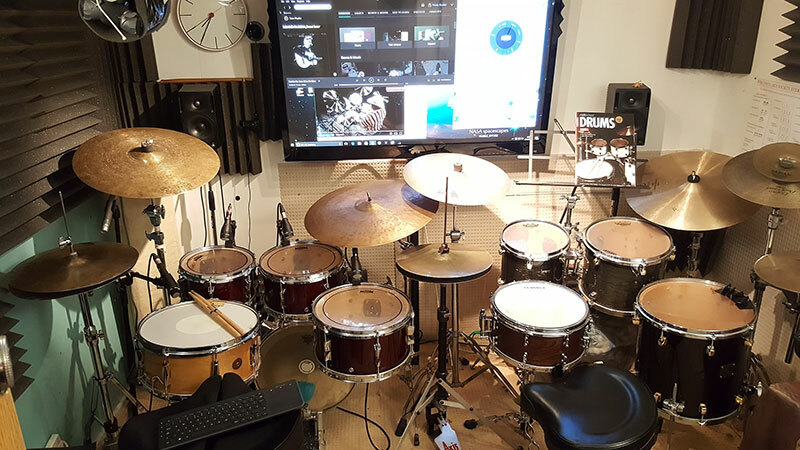 Two professional acoustic teacher and student drum kits with teaching aids displayed on full size monitor with PA system. Come and have a one off lesson and take it from there. If you have always wanted to play drums along to your favourite music, let’s get started! It goes without saying, you are never too old to learn how to play an instrument, at the other end of the scale from anything from 6 years old is a good age for a child to start learning and processing new information, or as soon as their legs can reach the drum pedals it depends. I can adapt the kit and seat height depending on the student although there is a limit to how low you can arrange things on a full size kit. Due to this the youngest age I can accept at the moment is from 10 years of age. Is there anything I need to bring to a drum lesson? Really you just need your to bring your ability to learn! I will supply some printed materials but it is also good to bring along a pad that I can write in with notes of the lesson each week. If you come regularly I will expect you to bring the notes in a folder each week. Should I buy some drum sticks? There are 3 basic types of wood to choose from, Maple being the lightest, then Hickory which is a medium weight and Oak the densest type of wood. If you are starting out the either Maple or Hickory is a fine choice as you won't be hitting the drums too hard for a while and will be easy on the wrists to play with. Size wise, typically range from a 7A which is a small diameter Jazz stick and good for younger ages to a medium diameter 5A which is probably the most common size along with 5B which is slightly more diameter. 2B's are quite large in diameter and not advisable if you are just starting out unless you have big hands. Vic Firth is a stick manufacturer and have just brought out "Kids Sticks" which are half size sticks and good for children up to about the age of 7 or 8. There are carbon sticks, metal sticks, plastic tip sticks, all great but I personally prefer the sound and feel of wood sticks throughout. The best place to check out a pair of sticks is a drum shop, your usually welcome to try out different sizes and see what "feels" good in your hands. If you speak to someone at the shop they should be able to give you some friendly advice on your first set of sticks too. Do I need a drum kit? You don't need a drum kit straight away to start learning how to play, in fact it is wise to wait and make sure this is something that you are going to dedicate a lot of time to. It is however, important to be able to practice some rudiments on a practice pad so I would encourage any beginner to get a practice pad with their first set of drumsticks. There is a good way of arranging your furniture to make up a mock drum set which I can show you during lessons. After a month or two and you are sure the drums are for you then it is a good time to start thinking about getting a drum set for regular practice. There are acoustic kits (live) or electric drums to choose from and a lot depends on whether you will be able to practice a live acoustic kit at home or in the garage. If your worried about upsetting your neighbours then an electric drum kit is a great option and you can potentially play with headphones on till late at night. (Although the pedals still make a little noise if you are in a flat). The cost of an acoustic drum set with a set of cymbals can be quite expensive although I have helped students in the past pick out professional kits from auction sites quite inexpensively. Cymbal manufacturers make cymbal "Packs" which contain all the cymbals you need to get going and this can be a really good option to start with as well. Can we learn to play 'The Pretender' by the Foo Fighters? Yes of course, as a beginner it won't be the first song you will learn but each lesson will work towards a goal be it 'The Pretender' or any other song of choice. I encourage students to bring along their favourite song or drumming track to work on together. Everything from Pop, Rock, Indie to Funk, Soul or Latin music, as a drum instructor it is my job to inspire, educate and point students in directions they have never thought about before, there are some incredible Cuban and African rhythms that can be applied to the drum set which every drummer should learn! Can you teach at my drum studio? Yes I am happy to give drum tuition at your studio or home but I will need to add in travelling costs and a minimum lesson time of 1 hour. How long should drum lesson times be? This depends on age and what you want to learn. For children under the age of approx 12, half an hour is suitable. Children love chunks of information so I will usually prepare 3 or 4 different ideas to work on during the lesson to keep things fresh and exciting. For more advanced players, I know when I am inspired about learning something an hour can go very quickly! If you are looking to learn the Moeller technique for example, anything from an hour up is suitable as I like to make sure the student actually "get's" the basic motion in one sitting. This way any practice the student does after the lesson is done correctly. Drum Studio Address: 6 Harts Lane, South Godstone. RH9 8LZ. 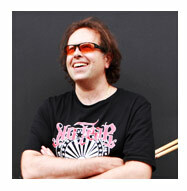 Dov has been playing the drums for 32 years and 20 of those playing professionally for a variety of artists & bands. He enjoys challenges, has lots of patience and takes pride in helping students achieve higher levels of playing. Find a Drum Teacher in Surrey & Kent. If your looking for Drum Lessons in Caterham, Oxted, Woldingham, Warlingham, Godstone & South Godstone, Lingfield & Dormansland, East Grinstead, Edenbridge & Westerham Dov's Drum Studio is no more than a 15 minutes drive. We will soon have the facility to provide drum lessons in London, rest of UK and Worldwide through Skype online. 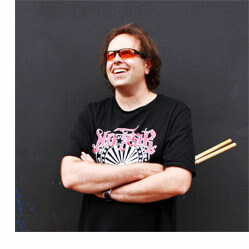 Perfect if you are looking for a drum teacher in London or anywhere else in the UK too far to travel to our drum studio.